Suspect who was arrested appears in surveillance video at the site of one of the explosions which killed 47 in Tripoli. Lebanese security forces arrested a suspect on Saturday in connection with Friday's devastating double bombing that killed at least 47 people in the northern city of Tripoli. Lebanon’s National News Agency identified the suspect as Sheik Ahmad al-Ghareeb. Police reportedly took him into custody at his home in the Miniyeh region outside Tripoli. According to the report, al-Ghareeb, who has ties to a Sunni organization that enjoys good relations with Lebanon’s powerful Shiite Hezbollah terrorist group, appears in a surveillance video at the site of one of the explosions. Lebanese police officials said Saturday that 47 people were killed in the twin explosions and that more than 500 wounded. Both blasts hit at the hour of weekly Muslim prayers, in a city where Sunni supporters of Syria's rebels engage in frequent, often deadly, clashes with Alawites, who back the Assad regime. Local television stations aired footage of the frantic first moments following the explosions: bodies scattered beside burning cars, charred victims trapped in smoking vehicles, bloodied casualties emerging from thick, black smoke and people shouting and screaming as they rushed victims away. The attacks in Tripoli came a week after a bombing in the Beirut bastion of Hezbollah, a close ally of Bashar Al-Assad, which killed 20 people. 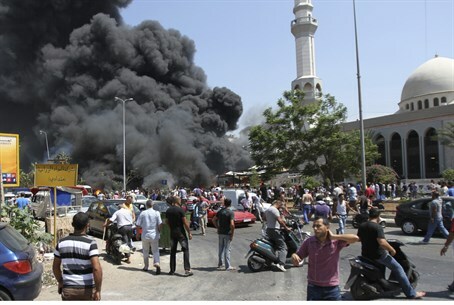 Hezbollah condemned the two explosions, saying the attacks seek to divide the region by inciting sectarian clashes.